Patricia "Tricia" Nixon Cox (born February 21, 1946) is the elder daughter of the 37th U.S. President Richard M. Nixon and First Lady Pat Nixon, and sister to Julie Nixon Eisenhower. Cox performed more of a ceremonial role during her father's political career than did her younger sister Julie Nixon Eisenhower, accompanying him to many campaign stops and, after his presidential inauguration, state trips around the world. She is married to Edward Finch Cox and is the mother of Christopher Nixon Cox. Cox was born on 21 February 1946, and grew up in New York City, attending the Chapin School in Manhattan. She attended Finch College, (a 2-year college), then Boston College in Boston, Massachusetts, graduating in 1968, major in English and receiving her Bachelor of Arts degree. At her graduation on June 14, 1968, her father served as a special guest speaker. 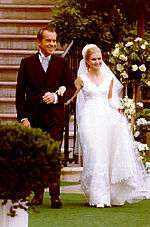 Cox married Harvard Law student Edward Finch Cox in a White House Rose Garden ceremony on June 12, 1971. She has lived a very private life in the suburbs of New York, and was a stay-at-home mother for her son, Christopher Nixon Cox, born in March 1979. Her husband is now a corporate attorney and the chairperson of the New York Republican State Committee. She serves on the boards of many medical-research institutions, as well as the Richard Nixon Foundation at the Nixon Library in California. ↑ Dean, John (1976). Blind Ambition The White House Years. New York, New York: Simon and Schuster. p. 161. ISBN 0671224387. 1 2 Doug Wead. All the Presidents' Children. Atria Books. p. 260. ISBN 0743446313. ↑ http://www.upi.com/Audio/Year_in_Review/Events-of-1971/12295509436546-1/#title "1971 Year in Review, UPI.com"
↑ "Nixon Daughters Bury the Hatchet". Time Magazine. May 6, 2002. ↑ "Who Owns Richard Nixon?". The New Yorker. May 20, 2014. Wikimedia Commons has media related to Tricia Nixon Cox.